Imagine you have worked for 30 years, just paid off the mortgage, and are ready to retire and enjoy the life you’ve built in that sleepy little town of Pascagoula. Not long after you settle into your golden years, a new family moves in next door along with their teenage son. One day you come home to find their son smashing the front windows of your home. The windows are beyond repair and will need to be replaced at some expense. You knock on the neighbor’s door to speak with the parents. They assure you that they will do everything in their power to make the situation right. A few weeks later, neither the boy, nor his parents, have made any progress at repairing the windows. You go back to their door again, only to be met with the same answers. The parents tell you that they have now hired an attorney who will be looking into what can be done to repair the windows. The attorney speaks with you and tells you he’ll do everything to find the culprits and a solution to your window problem. Are Supervisors Already Breaking Ranks? Troy Ross will be on WXXV-TV’s newscast tomorrow with his view of the Singing River pension problems. 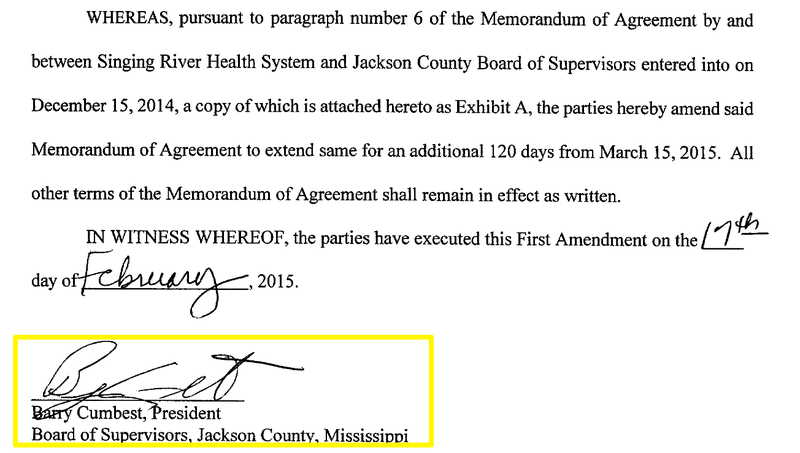 Might this also mean that The Mississippi Press will be publishing the story as told by the Board of Supervisors? The latest statement from the BoS is wide ranging and full of topics which require distillation and rebuttal. This week has already seen that from Sen. Brice Wiggins and SRHS trustee Scott Taylor. Over the coming days we will go point-by-point through the statment, today we address it generally. SRHS Watch will return to regular posting after attending to duties in our nation’s capital. The Board of Supervisors continues to build a fiction around the relationship with the Singing River Board of Trustees and also as to any possible resolution. SRHS Watch will again be dismantling this fiction. “We cannot pass a tax increase to support the pension plan. We can pass one to help the hospital in some ways, but we can’t raise taxes to support” a private plan. City Attorney Josh Danos who has left the firm of Dogan and Wilkinson to form a new partnership with former Chancellor Chuck Bordis was chosen to retain his position with the city following a mayor and council decision to terminate its contract with Dogan and Wilkinson. “This in no way negatively reflects on the Dogan and Wilkinson firm,” said Mayor Gordon Gollott. See the whole document here. The Sun Herald and WXXV report today that retirees spoke out at the Jackson County Board of Supervisors meeting, asking supervisors to remove board attorney Paula Stennett-Yancey.